The U.S. Labor Department said in its closely-watched jobs report Friday that nonfarm payrolls rose by 431,000 last month, the largest gain since March 2000. That followed an unrevised 290,000 increase in April….However, the May figure was boosted by the hiring of 411,000 temporary workers for the Census. Only 41,000 private-sector jobs were added. 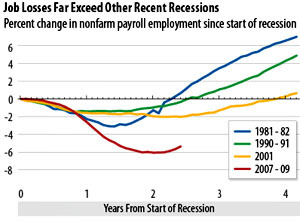 which has been leading the economy’s recovery, has added 126,000 jobs over the past five months. Construction, a sector of the economy that remains soft, lost 35,000 jobs in May. The construction sector number comes as no surprise. With the federal government’s tax credit for first-time home buyers expiring, the housing market is losing what little steam it had earlier in the year, and that promises to continue. As CBPP’s Chad Stone says, “Under these circumstances, policymakers should have no qualms about passing a robust jobs bill — indeed, they would be derelict not to.” Preach it, brother.